In Dropfleet, quite a few rules have slight variations or dependencies depending on two factors that both tell something about ship-size; hull and tonnage. This is stuff like how serious a catastrophic explosion is, if you can hold a critical location, are able to survey for critical locations etc. This design-choice originates from two factors, I assume. The first – and obvious – is realism. Some things can only be done – or is done differently – with a bigger ship. Not every little ship will carry the nukes to nuke something from orbit, but every major vessel could reasonably be assumed to do so. The other reason I guess is to make swarm-tactics less appealing. Many games suffer from design flaws that cause strategies build on swarming to be very viable where it obviously is not the intention seen from a “realism” stand point. For instance, speaking from a realism stand point, no major fleet (999 points for instance) would consist solely of frigates, so a number of design choices have been made to ensure this doesn’t happen by making frigates less appealing. I could make a 999p army with as little as a single light cruiser group (which in many ways behave like a frigate) but having only 1 medium group would mean I would almost be without ramming, nukes, the ability to survey a cluster and totally without Admiral bonus – and without functionality only found in cruisers and above like bulk landers, carriers (PHR as the sole exception), etc. I have for some time been wanting to do any overview of Hull and derived abilities or differences to try to better understand the dynamics and to spot patterns. For this post, I have made that overview which can be seen below. Since hull and tonnage do not translate one-to-one, I have elected to focus solely on abilities derived from hull. Hull-overview. In the centre, the hull-scale. To the left, all ship-denominations for the individuel fleets color-coded by tonnage. To the right the five areas with hull-dependent differences. First of all, looking at the denominations across the hull-sizes there are some clear patterns. The PHR break the pattern of otherwise strict one-to-one translation from hull to tonnage. However, if we choose to ignore the wayward troopship, Light tonnage ships have from 1 to 5 hull, Medium tonnage have from 7 to 11 hull, Heavy tonnage have from 11 to 15 hull and Super Heavies from 18 to 22. It is from this overview clear how much more hull PHR have overall and – similarly – how much less Shaltari have. If we look into the rules differences, we see som interesting patterns. The first pattern is 1 to 3 hull. These are obviously heavily limited. No active scan order and inability to score critical locations are annoying penalties, whereas the ability to ignore catastrophic damage is a gigantic advantage making a hull 3 ships (of which none exists at the moment) considerably more durable than a hull 4 ship. 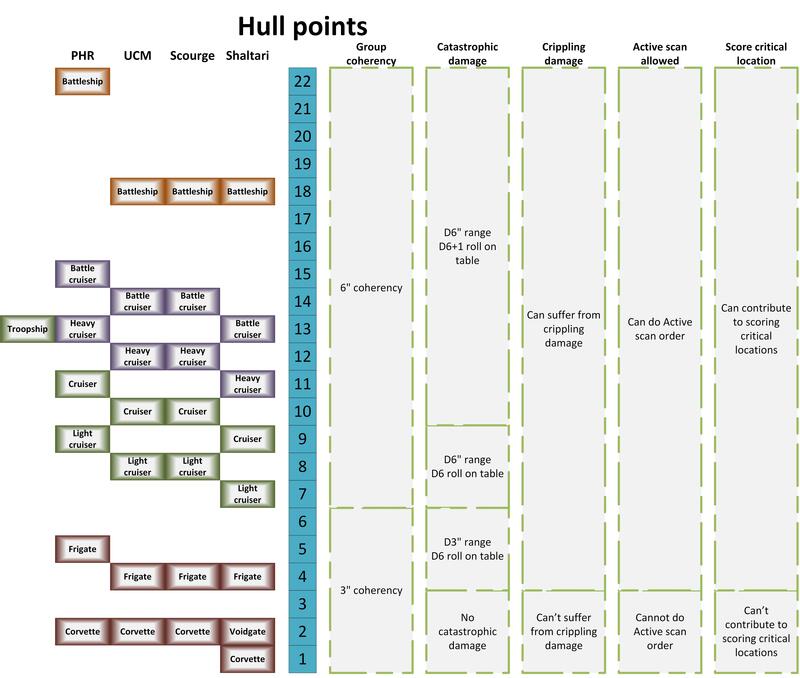 I guess for that reason we will never see a hull 3 ship – simply because this is counter-intuitive – read more about durability in comparison to hull points here. The second dividing line is between 6 and 7 hull. At 7 hull ships have greater distance in a group and make bigger explosions. We are obviously going from small ships to proper ships. If we ever see a ship of hull 6 my guess is that it will be a light tonnage ship. From here on, not many more interesting patterns emerge. From light cruiser to battle cruiser only how to roll catastrophic rolls changes and (solely due to PHR ship denominations) the lines between medium and heavy tonnage blurs a little. In addition, a few abilities are tied to Medium tonnage ships; ramming, nukes and surveying clusters. In addition, Heavy and Super Heavy tonnage have Admiral bonuses. These are not in the above view due to the already mentioned fact, that tonnage level does not translate one-to-one into hull. My lesson from this simple overview is that there are two major divides; between 3 and 4 hull where we go from almost-not-a-ship to a small ship and from 6 to 7 where we go from a small ship to a proper ship. This will hopefully also help me remember the catastrophic damage rules a bit better – the exact limits for the different changes were always a bit blurry in my memory before this.